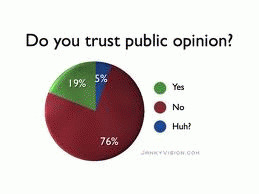 In many western democracies, government by the people has been replaced by government by public opinion polls. Opinion polls are meant to represent scientifically validated studies of the views of voters. However I believe their true purpose is to discredit (via low ratings) Democratic and progressive candidates and issues, while simultaneously pressuring voters to support more "popular" candidates and causes. The documented bias in polling towards conservative and Republican candidates -- owing to the systematic exclusion of voters under 29, minorities, and long income voters -- has become so extreme that it's ludicrous for polling services and mainstream media to keep up the pretense any longer. The main problem with existing public opinion polls is that they're mainly based on calls to voters' landline phones. With the escalating number of landline-free homes throughout the developed world, this is a major problem -- particularly as adults under 29, minorities, and low income families are the most likely to have cellphone-only households. The substantial increase in landline-free homes has a serious impact on health research (smoking, obesity, chronic illness, immunization rates, etc), which is why both the Pew Research Center and the Center for Disease Contol (CDC) have made a systematic effort to ascertain the exact prevalence of cellphone-only homes. Owing to the "cohort" effect, landline-free homes are increasing by between 3-5% a year. A increasing percentage of eighteen year olds are opting not to install landlines. Moreover just because someone turns thirty doesn't make them suddenly give up their cellphone in favor of a landline. The most recent research from the CDC shows that 27% of US households have no landline, though there are wild variations between states. For example, 13% of households in Rhode Island and New Jersey have no landline, while 35% of households in Arkansas have cellphones only. 49% of 25-29 year olds live in homes with no landline. only 7% of landline respondents were under 30 (20% of the 2010 midterm vote came from Americans under 30 -- see http://www.civicyouth.org/youth-turnout-about-20-comparable-to-recent-midterm-years/). twice as many cellphone respondents (14%) as landline respondents (7%) were African American. According to the Pew study, the exclusion of cellphone-only households from 2010 polls caused Democrats to poll 7% lower than in surveys that included cellphones. Gallup, to their credit, now includes cellphones in their political polling. Even so, cellphone polling introduces a variety of logistical problems that affects its validity. There are no standard directories of cellphone numbers, and many states ban randomized computer generation off cellphone numbers. Cellphone users (especially when there's a charge for receiving cellphone calls) are far more likely to reject a call from an unknown phone number. There are also ethical issues -- for example if a pollster dials the cellphone number of a minor child or someone who's driving.